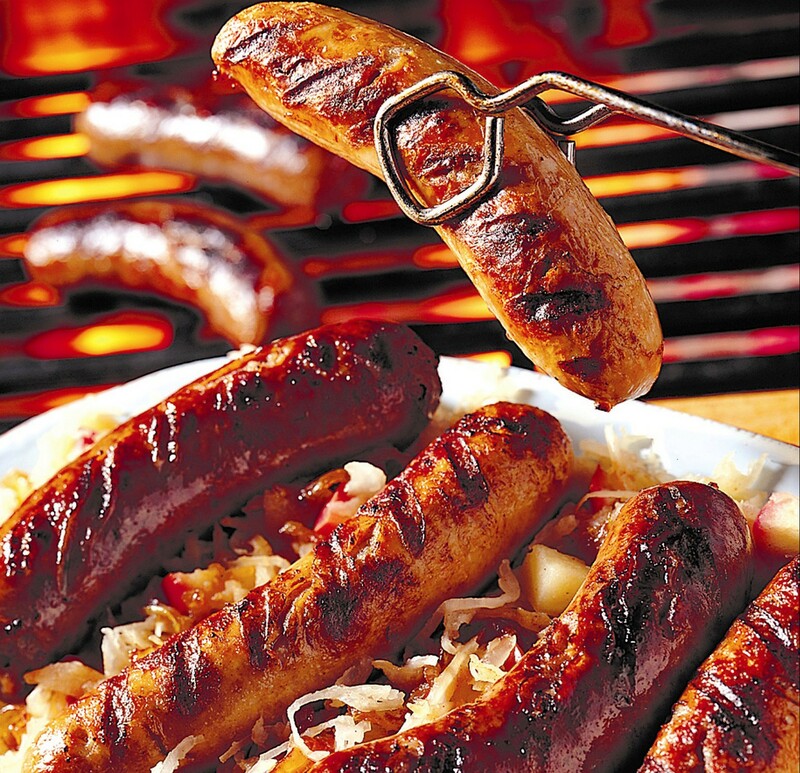 Fantastic Bratwurst Recipe - perfect for Oktoberfest celebrations. German cooks braise sauerkraut with onions, apples, seasonings, a touch of sugar and a little of the region's Riesling wine, creating an addictive accompaniment for juicy bratwurst. We recommend using Swiss Deli Veal Bratwurst or Spicy Bratwurst for this dish. 1- In a large, cast-iron casserole, heat 2 tablespoons of the oil until shimmering. Add the Swiss Deli Streaky Bacon and cook over moderately high heat until the fat is rendered and the bacon is crisp, about 5 minutes. Using a slotted spoon, transfer the bacon to a paper towel–lined plate. 2- Add the onion to the casserole, cover partially and cook over moderately low heat, stirring occasionally, until very soft, about 20 minutes. Increase the heat to moderately high. Add the wine, apple, juniper berries, bay leaves, sugar, 1 teaspoon of salt and 1/2 teaspoon of pepper and boil for 3 minutes. Add the water and the sauerkraut. Reduce the heat to low, cover and cook until the apple is very tender, about 45 minutes. 3- In a large skillet, heat the remaining 2 tablespoons of oil until shimmering. Poke the Swiss Deli Veal Bratwurst sausages several times with a fork and cook them over moderate heat, turning several times, until golden and heated through, about 8 minutes. 4- Spoon the sauerkraut onto a platter and arrange the sausages on top. Sprinkle the reserved bacon over the sausages and serve with mustard.